In 1915, F.X. 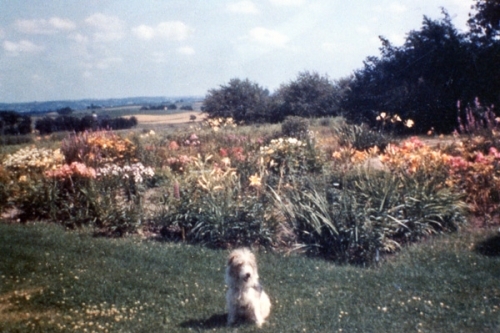 Schreiner [pictured above in his Minnesota garden], a buyer for a department store in St. Paul, MN, decided to move his family to the country to more seriously pursue his hobbies of gardening and animal husbandry. In 1920, while on a buying trip to the east, F.X. met John Wister, the first president of the recently founded American Iris Society. This chance meeting sparked F.X.’s interest in Iris and soon he was a serious collector. Few Iris were available at that time from American sources. Most had to be imported from various European growers. Since F.X.’s work involved lots of travel, his eldest son, Robert, was given the responsibility for nursing the new Iris acquisitions along in the harsh Minnesota climate. To encourage his son’s interest, F.X. gave Robert the great Dykes monograph, The Genus Iris. Bob keenly studied this book, reading of obscure Iris species growing in exotic locations around the globe. His curiosity piqued, Bob would write botany departments or consulates in these far-off lands, requesting seed of these Iris. 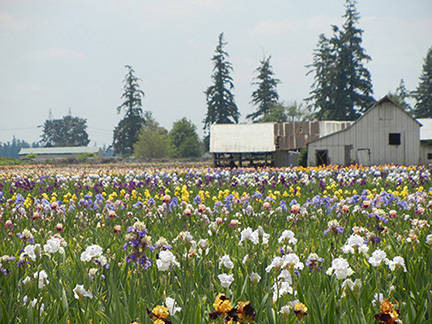 By 1925, F.X.’s interest in Iris had grown to the extent that he was growing over 500 varieties on over an acre of ground. He decided to sell these Iris commercially in order to finance the acquisition and care of new Iris. In 1925, F.X. Schreiner published his first price list. His first catalog, black and white with no pictures, was published in 1928. F.X. passed away in 1931. Before his death, he offered his three children, Bob, Connie and Bernard (Gus), two pieces of advice. First, that if they were able to get along, the Iris venture would be a nice business. Secondly, should they decide to pursue the business, a more agreeable climate would offer a better chance of success. Robert had to withdraw from his plant science studies at the University of Minnesota to tend the Iris business. Connie worked in the office in her spare time while attending the University of Minnesota. Gus worked in the fields during his summer vacations. The serious dust storms of the 30’s had a devastating effect on the Iris. Bloom seasons would be ruined with one strong windstorm. The harsh Minnesota winter would wipe out whole breeding lines. Bob began studying USDA yearbooks looking for a more suitable site. Iris were sent to several areas of the country to be tested. We raised Iris in Grants Pass, Oregon, for example, from 1935 to 1937, although we didn’t move to Oregon permanently until much later. 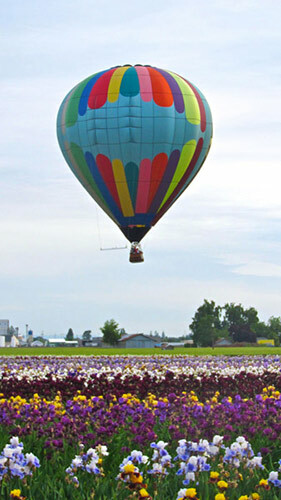 Ultimately, the Willamette Valley was selected as the new home for the Schreiners. The decision was based on excellent soil, an ideal climate for growing Iris, and the proximity to transportation facilities. Today the office and gardens are located on the original plot of land in the Quinaby district north of Salem, where we have been since 1947. This country has been a happy choice for growing Iris. By the end of World War II, both Connie and Gus had decided to join the business full time. The move to Oregon was completed in 1947, the original site being a home, (now Schreiner’s office) and 15 acres. There was a sense of security in the new climate. The long growing season allowed the business to expand and it grew rapidly. 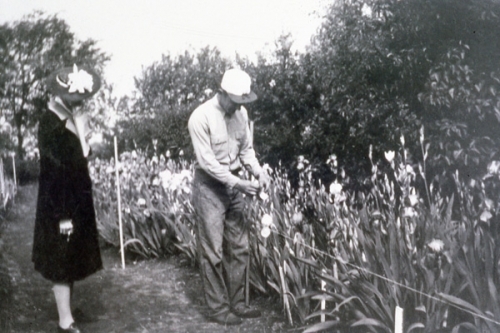 The success of the business had other manifestations -- the first color catalog was printed in 1947 and the Iris breeding program was in full swing. During this time, Connie managed the business affairs of the office. Connie loved traveling and meeting people, so she often represented Schreiner’s at national conventions. Bob wrote the annual catalog each winter and took photographs each bloom season. His natural, curious spirit and fascination with plants enabled him to assist Gus with the hybridizing program each spring. Bob and Gus loved the onset of spring, anticipating the promise the seedling fields held. 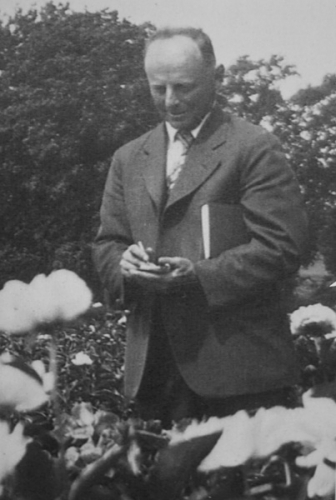 In addition to hybridizing, Gus’ duties included running the outside crew, which dug and processed the orders and transplanted the fields each fall. 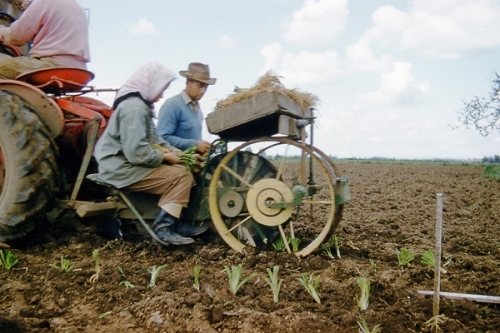 He loved working with the soil and meeting the challenges he faced in the field culture of the Iris. In the early 70’s there was an explosive interest in Iris, with huge national nurseries needing enormous numbers of bearded Iris. This signaled a period of rather rapid change and expansion for the business. From a stable size of 50 acres the planting quickly doubled to 100, and then again to 200 acres. This excitement was tempered, however, by the untimely deaths of the Schreiner siblings who had built this company up from the dirt of Minnesota. Connie died in 1971, Gus passed away in 1982, and Bob died in 2000. During the 1980’s the third generation gradually assumed responsibilities in running the business. David, Robert’s son, was largely responsible for the catalog and business matters. Tom Abrego, David’s brother-in-law, served as the comptroller, and also worked on the catalog and advertising. In 2011 Tom and David retired. Today, Gus’ son Ray is in charge of the hybridizing, field culture and production, landscaping the gardens, and wholesale accounts. Liz (Schreiner) Schmidt, Gus’ daughter, manages the office, Gift Shop, business matters, catalog, etc. Another of Gus’ sons, Steve, handles the flower show, photography and retail orders. Leonard Schmidt, Liz’s husband, helps with the general maintenance and keeps track of the required farm regulations. During the summer some of the fourth generation may be found in the packing sheds, working to fill orders. The Iris grown here at Schreiner's Iris Gardens have reaped praise from our thousands of customers as well. One of the most cherished possessions is the file of letters from customers, gathered over the years. Many steadfast friendships have developed over time with people we have met through the Iris. These human connections as well as the awards and achievements enjoyed by the Schreiners are a result of the foresight of F.X. Schreiner and the hard work of Robert, Connie and Bernard, their dedication to and love of horticulture in general, and Iris in particular.